The caravan arrived in Red Larch a couple of days after the Orc ambush took place. The party went its separate ways for a while tending to needs such as resting, eating, and engaging with the local community. Wilbin went into a local bakers and asked Beyla, a Dwarf Baker for her famous crumblecake recipe. She wasn’t so sure giving away her recipe to a well-armed stranger was a good idea, but some smooth talking on Wilbin’s part, (and the offer of a tidy sum of gold) brought her around. After securing his new recipe, Wilbin went to the town’s inn to celebrate. Daenir decided he would spend some time carving adorable little dragon statues for his new companions. However, his skills were not quite up to the task of carving such intricate detail as dragon scales. As such, the carvings came out a little crude, but he still gave them to his new friends who seemed to appreciate the gesture (although one of them thought it was a statue of a dog). Jasper walked about the town enjoying the relative peace and solitude. As Jasper neared the stables, she decided to check in on the horses to make sure they were being treated well. She cast her new spell which allowed her to communicate with animals, and proceeded to have a conversation with a pair of horses. The horses seemed pretty freaked out that an Elf was talking to them, but a gentle ear rub or head stroke alleviated their concerns. After ensuring the beasts were happy, Jasper found herself a tree to sleep in, away from the hustle and bustle of the noisy tavern. Langley headed straight for the inn and began talking with the barkeep, Anlow Coyle, about local breweries and their produce. Langley was a member of a famous brewer’s guild, and so he liked to discuss the art of beer making with other like-minded people. The pair got on famously and decided to work together to find the perfect beer to complement a slice of crumblecake. Sensing a potential business opportunity, Anlow agreed to help. Once the inn was closed for the evening, the pair stayed up for many hours drinking various ales and eating crumblecake. Sebastien decided he needed a stiff drink after the stresses of the road. Being a man attracted to power, he found himself at the table of Navaren Kreel, the Townmaster of Red Larch. After drinking with the jovial figurehead and catching up on current events, Sebastien decided to retire to his room and get a night of well deserved rest. Before he could, however, he met a young Tiefling mage by the name of Tajan. He arrived into Red Larch very late and was looking for a way to leave the Sword Coast at haste. Sebastien informed him of the caravan he was part of and agreed to talk to Belbrek about bringing him on board in the morning. During the evenings activities, the party met a Cleric sat quietly in the tavern. Her name was Lyfalia, and she was sent to Red Larch to investigate a strange case. Deformed trees had been reportedly shouting at people approaching the edge of the Kryptgarden Forest. These trees spoke of the woods being cursed and only death awaiting those who entered its borders. Lyfalia didn’t believe in trees cursing people, but she didn’t know enough about this region to dismiss it either. The party discussed the matter and decided that the following day they would help Lyfalia with her investigation. As the party prepared to call it a night, Wilbin lockpicked his way into Daenir’s room that he rented for the night, and went to sleep in his bed. When Daenir found him, he slowly pulled the sheet onto the floor and left the snoring halfling to his slumber. Jasper found herself wanting to talk to Lyfalia more, but struggled to formulate coherent sentences around the Elf Cleric. After Lyfalia had retired for the evening, Jasper went to Langley, who she saw as the most socially capable of the group, and asked him how one goes about making a new friend in a civilised fashion. The pair totally misunderstood one another and instead ended up drinking lots and talking about anything and everything. 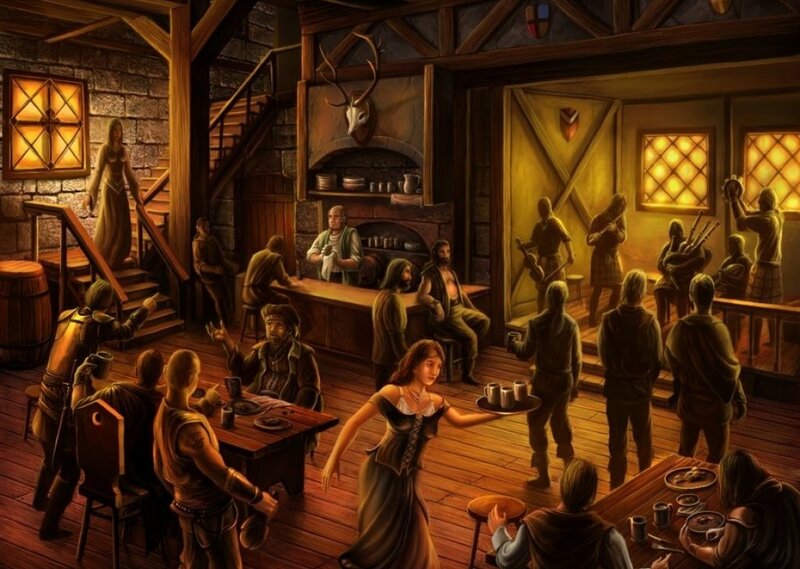 After a night of blissful slumber for some, and endless boozing for others, the party assembled in the tavern for breakfast while they awaited Sister Lyfalia. Sebastien decided he wanted to sleep more than help some Elf Cleric, so he stayed in bed and let the others play detectives. Once Lyfalia arrived, the group borrowed some horses and set off north-east to the edge of Kryptgarden Forest. They found the trees in question on the edge of a farm. Despite the trees being loud and a little scary, the party strolled past them without any concerns as the trees seemed to be clever illusions cast by someone. They entered the wood and followed a small path. Eventually the party reached a cave. Inside they found a lone figure dressed in unusual clothing and muttering to himself. Wilbin tried to talk to him, but the figure attacked the party with magic. 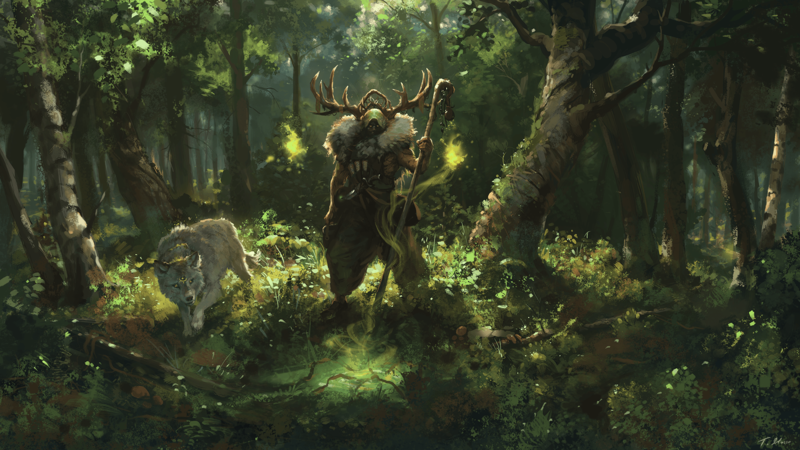 The crazy man was a powerful druid who called upon natural magic to protect himself and attack the party. Daenir tried to use his new spell, thunder wave to bring down the druid, but his eagerness to help made him careless. The thunder wave reverberated around the cave smashing friend and foe aside. The druid’s armour kept him relatively safe, but Jasper and Langley weren’t so fortunate. Eventually after a combined effort from all the heroes, the druid was brought down with Wilbin landing the critical blow that pierced through the bark skin armour of the spell caster. Unfortunately the Druid died of his severe injuries before he could explain what he was doing there and why. The party returned to Red Larch where they parted ways with Lyfalia, who returned to her sacred order’s sanctum in Everlund. With the mystery solved the party were ready to find Belbrek and get back on the road to Silverymoon.